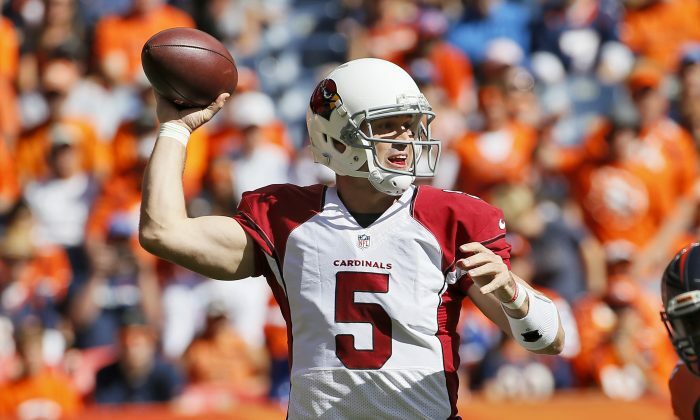 The Arizona Cardinals beat the Rams on Sunday, but they lost starting quarterback Carson Palmer for the season, and they’re again forced to rely on the arm of backup Drew Stanton. The Cardinals possess the best record in the NFL at 8-1. Here’s a few of the backup quarterbacks who led their teams to Super Bowls. Roger Staubach, Dallas Cowboys: Roger Staubach and Craig Morton alternated at quarterback during the 1971 NFL season, but coach Tom Landry eventually settled on Staubach as the starter, and he took the Dallas Cowboys to Super Bowl VI, where the team won its first Super Bowl. he was named the Super Bowl MVP. Terry Bradshaw, Pittsburgh Steelers: Known for his four Super Bowl victories, Bradshaw once served as a backup in 1974 to starter Joe Gilliam. Gilliam started the first four games before coach Chuck Noll inserted Bradshaw as the starter. The Steelers eventually compiled a 10-3-1 record and made it to Super Bowl IX, beating the Minnesota Vikings. Jim Plunkett, Oakland Raiders: After bouncing around the NFL, 1970 Heisman winner Jim Plunkett compiled an unimpressive record before he signed with the Raiders as a backup. Starter Dan Pastorini broke his leg, and 33-year-old Plunkett got his team to the Wild Card in 1980. The Raiders eventually took down the Philadelphia Eagles 27-10 in the Super Bowl, where Plunkett was named MVP. Jeff Hostetler, NY Giants: Phil Simms, the perennial starter for the New York Giants, was injured in the 1990, forcing the team to rely on backup Jeff Hostetler (who later played for the Raiders). Hostetler only started two games in his seven years as the Giants backup, and the team won their final two games before making a playoff run. They defeated the Buffalo Bills 20-19 after Bills kicker Scott Norwood missed an easy field goal (“Wide Right”). Kurt Warner, St Louis Rams: A virtual unknown until his first start in 1999, Kurt Warner undrafted and famously played Arena Football before starting QB Trent Green went down in the preseason. Warner proved to be more than capable, leading the St. Louis Rams to one of the best offensive seasons in NFL history. He was named the MVP during Super Bowl XXXIV after the Rams beat the Tennessee Titans. Trent Dilfer, Baltimore Ravens: The epitome of a “game-manager” quarterback, Trent Dilfer didn’t have to do much after he replaced starting quarterback Tony Banks midway through the 2000 season. The crushing Ravens defense along with elite running back Jamal Lewis basically carried the team before pummeling the New York Giants 34-7 in one of the most lopsided Super Bowls in recent memory. Tom Brady, New England Patriots: Future NFL Hall-of-Fame lock Tom Brady’s story is well-known by now: he was passed over by most teams, drafted in the sixth round, and was only inserted after Drew Bledsoe was injured. Brady and the Patriots’ highly ranked defense beat the St. Louis Rams 20-17. He was named MVP after the victory.